Brad Cole Construction employees Zach Wingo, Matt Jordan and Diego Menendez had a most exciting day at work. They were walking to Pond 5 at the Giti Tire project to inspect the outlet structure. As they began walking around the pond, they noticed a hawk sitting in the water, wings folded back, not moving. The men attempted to scare it away, but the hawk would not move. Eventually they decided that something must be wrong with the hawk, and that they would have to go inside the pond to get it out. Upon entering the water, the hawk was very still and docile. Menendez walked behind the hawk and began slowly lifting him out of the water. That is when the employees realized the hawk’s feet were tangled in slope matting, which had become submerged at the bottom of the pond. They ended up ripping up the slope matting and dragging it along with the hawk onto the bank. Once on the bank, it was a matter of untangling the talons from the slope matting. “Every time one foot would become free, he’d step back and get re-tangled,” said Menendez. That process took around 20 minutes. 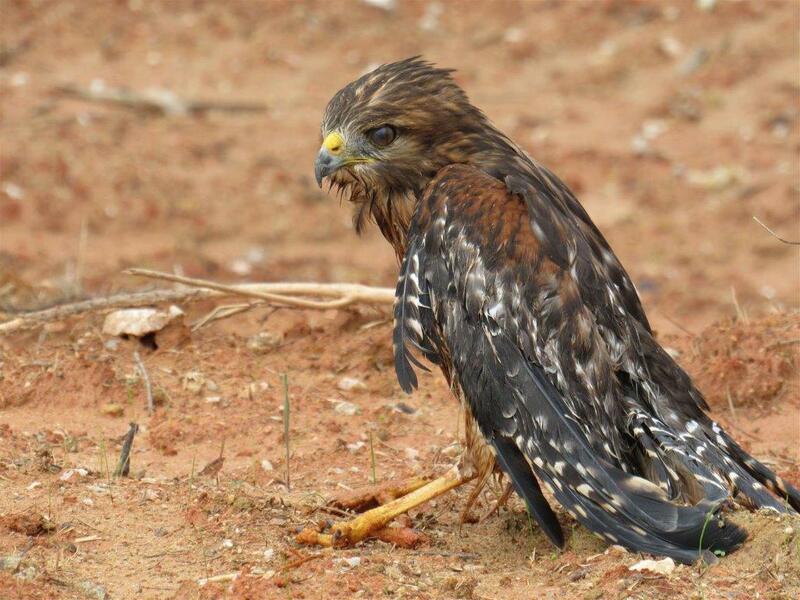 Once the hawk was free, it was carried to a flat area to dry and hopefully fly off. Half an hour later, the men walked back to the truck and saw the hawk still sitting where it had been left. Assuming he was unable to fly due to still being wet, they brought the bird with them to the office trailer. The plan was to keep the hawk away from the pond until it was dry enough to fly. Joe Ramsey, construction manager for Giti Tire, was at the BCC trailer when the employees arrived. He instructed them to seek medical attention for the hawk; Giti Tire would graciously pay all the bills. After a few quick phone calls, Menendez was headed to the Carolina Waterfowl Rescue Center in Charlotte; the bird in a cardboard box, wrapped in a Brad Cole Construction safety vest, riding shotgun. Upon initial inspection, it was determined the hawk had broken its left foot while attempting to free itself from the slope matting. 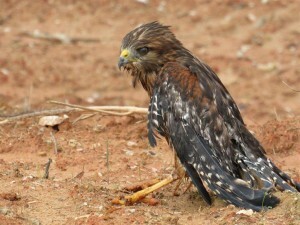 The initial struggle had fatigued the hawk as well. 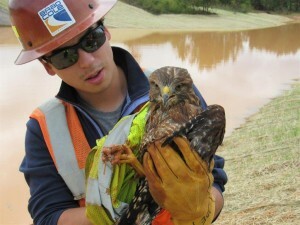 Due to the extent of the bird’s injuries, the hawk was sent to the Huntsville Raptor Center. Upon completion of its treatment, the hawk will be released back to it’s natural habitat at the Giti Tire Manufacturing Facility. 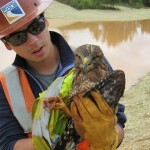 Thank you to Zach (Potter), Matt, Diego, Mr. Ramsey and Giti Tire for helping save and protect this piece of wildlife! Job well done!